» Career Deconstruction: Is Will Ferrell in Decline? On Friday, a new comedy starring Will Ferrell will arrive in theaters. Get Hard could be funnier than the most recent season of Broad City and more gripping than the Russian roulette scene from The Deer Hunter. But based on the ads, Get Hard seems ideal for half-watching over the course of a dozen 10-minute drop-ins on HBO. This is true of a lot of Will Ferrell movies lately. In the past six or seven years, Ferrell has come to specialize in comedies you wind up seeing without really trying. Let’s withhold judgment on Get Hard for now. What do we already know about Will Ferrell? For starters, he’s the most beloved comic leading man of the early 21st century.1 His movies have grossed a combined $1.89 billion, with eight films making $100 million or more since 2003, the year that Elf officially made Ferrell a bankable lead. With 2004’s Anchorman: The Legend of Ron Burgundy, Ferrell became the primary driver — alongside cowriter, director, and frequent coconspirator Adam McKay — of the funniest mainstream comedy released since 2000. (Unless you believe that another Ferrell-McKay movie, 2008’s Step Brothers, deserves that distinction.) As the cofounder, again with McKay, of Funny or Die, Ferrell has helped countless burgeoning talents achieve wider exposure. As a producer, he’s shepherded wonderfully weird (or just plain weird) projects to screens both small (Eastbound & Down) and big (Tim and Eric’s Billion Dollar Movie). It’s impossible to imagine the landscape of modern comedy without him. Ferrell, on balance, is a force for good in the universe. So, somebody is going to see Get Hard, whether it’s fans of Ferrell or stubborn Kevin Hart backers who somehow weren’t completely discouraged by The Wedding Ringer. But looking more broadly at Ferrell’s career, particularly his post–Step Brothers work, reveals that something is a little … off. The glory years of Ferrell’s filmography are 2003 to 2008: He made a staggering 17 movies during this period, including Elf, Anchorman, Old School, Melinda and Melinda,2 Talladega Nights: The Ballad of Ricky Bobby, Stranger Than Fiction, Blades of Glory, and Step Brothers. As Tina Fey once put it, “There’s something about Will that is so completely American — a tall, white version of America that you used to see in ’70s movies and TV.” These were the films, arriving after a seven-year run on Saturday Night Live, that crystallized Ferrell’s “tall, white” appeal. He both embodied and parodied caucasity, portraying the archetypical straight white male as a comically hairy-chested, generously love-handled, and all-around dopey dude-child swaggering cluelessly toward obsolescence. Mocking and celebrating the incredible shrinking white guy has always been central to Ferrell’s persona. His rise to movie stardom coincided perfectly with the second-term collapse of the Bush administration, which Ferrell expertly savaged in his 2009 one-man show, You’re Welcome America: A Final Night With George W. Bush. But like the real George W. Bush, Ron Burgundy and Ricky Bobby played well with audiences who didn’t get the joke and were inclined to appreciate Ferrell’s cocksure clownishness at face value. Ferrell, a former frat boy done good, escorted bros out of pop culture’s power center even as they quoted his dialogue like scripture. Ferrell’s first major career failure came after Bush left office. In 2009, Land of the Lost became his biggest flop ($68.8 million gross vs. a reported $100 million budget) and among the worst disasters in Hollywood history. (Thanks, Obama.) Land of the Lost put Ferrell at the top of Forbes’s list of most overpaid actors, though he subsequently rebounded by doing good business with The Other Guys, Megamind, Anchorman 2: The Legend Continues, and The Lego Movie, all of which grossed more than $100 million. At the moment, Ferrell is probably still the surest thing when it comes to big-time studio comedies. He won’t be shuttled off to the Dan Aykroyd Home for SNL-Bred Ex–Box Office Champs anytime soon. What’s askew now is Ferrell’s sense of creative balance. He’s known for playing two kinds of characters: the naive innocent (The Other Guys and Casa de Mi Padre) or the smarm-monster (The Campaign or Anchorman 2). But Ferrell has also smartly balanced two kinds of movies, chasing broad, crowd-pleasing comedies with more whimsical projects verging on anti-comedy. Ferrell has managed his career in the same manner as the Beatles and Kanye West — self-indulgent strangeness never comes at the expense of hits, and vice versa. Ferrell has typically confined his anti-comedy impulses to Funny or Die and stunt-y goofs like those Old Milwaukee commercials. But as his broad comedies have grown broader (and less funny), Ferrell has also been bolder about exposing his freaky underbelly to a general-interest audience. Anchorman 2 is another indulgent tangent, only this time disguised as crowd-pleasing populism. Between reprising the hits (the cameo-rich news team brawl; the ironic sexism and racism; “Whammy!”), Ferrell and McKay take Anchorman in a wanky prog-rock direction, committing to a love song for a shark like Keith Emerson leaning into a 12-minute keyboard solo. Again, I’m a homer, so I liked about half of Anchorman 2.4 But there’s not a cogent argument that justifies this movie’s existence. Anchorman 2 goes nowhere outside of its own colon. 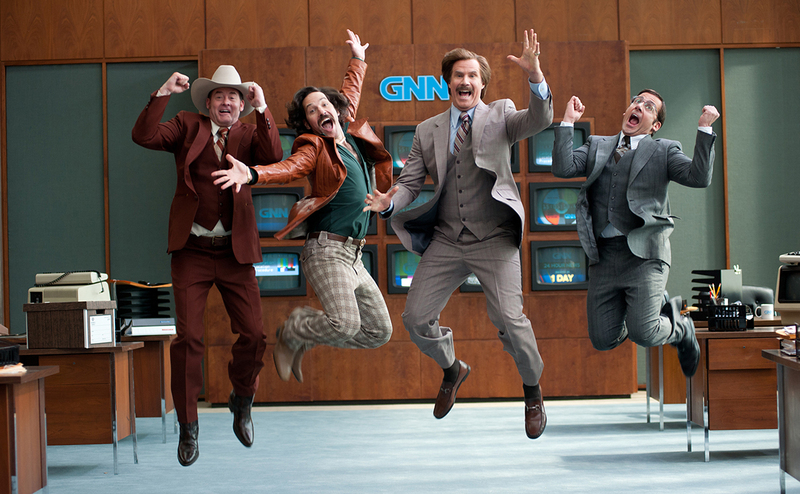 Anchorman 2 grossed $173 million, nearly twice what the first Anchorman did. But is it possible that Ferrell has arrived at some sort of crossroads? Allow me to gingerly broach a subject that’s routinely raised less tactfully with regard to actresses: Will Ferrell has aged out of his dorm-poster period. He turns 48 in July. He hasn’t been a cast member on Saturday Night Live for 13 seasons. (For perspective, Eddie Murphy’s heyday was 11 years in the rearview when Ferrell joined SNL in 1995.) Today’s middle schoolers have no first-hand knowledge of “Celebrity Jeopardy” or Bill Brasky. “More Cowbell” might as well be “I’m Chevy Chase … and you’re not” as far as the youngs are concerned. Ferrell’s Lego Movie costar Chris Pratt is moving into the “likable doughy Caucasian” lane. The world inches forward. So, what now? Ferrell has mostly avoided the normal aging-comedian stuff. The exception is 2011’s Everything Must Go, in which he pulled a Riggan Thomson, making a bid for dramatic actor respectability via an earnest Raymond Carver adaptation. 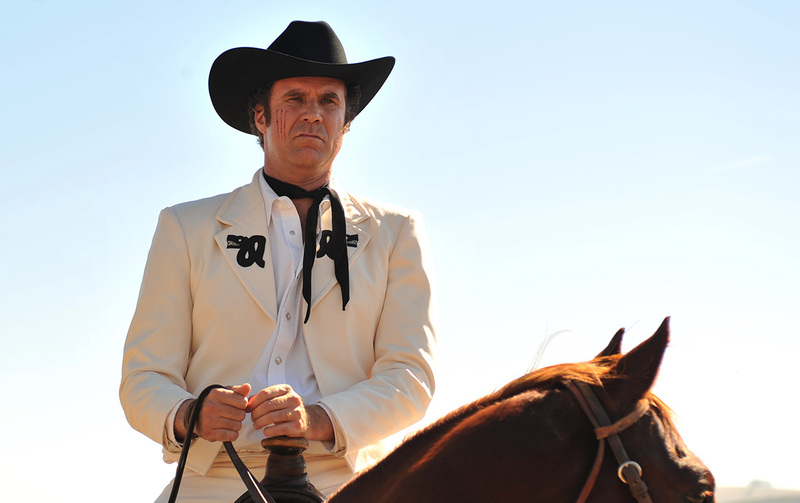 Ferrell is thoughtfully understated in the movie, playing an alcoholic whose life falls apart and who, in the process, learns important life lessons. (“Lost is a good place to find yourself” is the movie’s tagline.) But Everything Must Go is basically a weak iteration of an already weak Steve Carell–type vehicle — it’s Ferrell’s Dan in Real Life, not the Foxcatcher that would’ve truly put Ferrell’s career in a different place. But even if Ferrell somehow landed the equivalent of playing Channing Tatum’s wrestling coach or Matt Damon’s therapist, would anyone want to see it? Let’s compare Ferrell with comedy’s defining man-baby of a previous generation, Steve Martin.5 Like Ferrell, Martin’s specialty in his ’70s and ’80s prime was playing either a sweet moron (The Jerk) or a dirty rotten scoundrel (Dirty Rotten Scoundrels). Martin also balanced MOR comedies (like All of Me and Planes, Trains & Automobiles) with high-concept curveballs (like Dead Men Don’t Wear Plaid and The Man With Two Brains) until his late forties. Martin turned 48 in 1993, when he was coming off the first Father of the Bride, Lawrence Kasdan’s “boomers in existential funk” picture Grand Canyon, and the Goldie Hawn rom-com HouseSitter. Martin’s next three films represented a similar mix: the dramatic character study A Simple Twist of Fate, the second-tier Nora Ephron comedy Mixed Nuts, and a Father of the Bride sequel. And so went Martin’s subsequent film career. Like so many comics who become movie stars, Martin onscreen went from playing a wild and crazy guy to yet another neurotic and broken dad. Where Martin and Ferrell diverge is Martin’s desire to branch out beyond comedy into side careers as a novelist, playwright, and musician. Ferrell has no apparent need to be taken seriously by the intelligentsia — the bugaboo of so many comic geniuses, from Chaplin on down. He has yet to pursue straight-up Oscar bait or any other traditional accoutrement of prestige. He’s not into “higher” forms of art. Ferrell has instead concerned himself with a different, more modern form of credibility deriving from alt-comedy buffs and the loopier regions of the Internet. For the promotion of Get Hard, Ferrell has carefully stage-managed his talk-show appearances as viral opportunities, donning leprechaun garb on Letterman and a Little Debbie costume on Fallon. Ferrell took this practice to the extreme for Anchorman 2, bumbling through a real-life TV broadcast in Bismarck and making Peyton Manning squirm during an ESPN interview. It remains to be seen how this pays off for his new movie, but for Anchorman 2, the comedy in the marketing bested the comedy in the actual film. Ferrell’s upcoming projects appear to be business as usual. He’ll reteam with his Other Guys costar Mark Wahlberg in the family comedy Daddy’s Home; among the film’s writers are McKay and Get Hard director Etan Cohen. Also on the docket is Zoolander 2, in which Ferrell will reprise his role as the grotesque villain, Mugatu, a Ron Burgundy with the ugliness turned inside-out. Like most humans, I enjoy watching Will Ferrell, no matter the project. At his worst, he’s still amusing.6 But what does his best look like moving forward? There’s evidence that Ferrell is evolving into a Ted Knight figure eternally game for Judge Smailsing it up for a younger generation of Dannys. Ferrell played that role for Pratt in The Lego Movie, and his out-of-touch squareness in relation to Hart has been the primary selling point of Get Hard. This archetype isn’t that far from Ron Burgundy and Ricky Bobby, though it requires Ferrell to be the anachronistic foil rather than the anachronistic protagonist. Imagine an Anchorman reboot told from Veronica Corningstone’s point of view. That’s the future, whereas the stock Ferrell character — so dumb, so white bread, so guilelessly destructive — looks more and more like a heel in contemporary culture. Ferrell himself understands that our nation’s frat-dude days are over. As our funniest symbol of buffoonish white privilege, he has the ability to help ridicule it out of existence. All due respect to the decomposing corpses of Vince Vaughn and Ben Stiller. I know what you’re thinking: Melinda and Melinda absolutely does not belong on a list of Will Ferrell highlights. But here’s the thing: I’m a fan! I’m the only fan. Radha Mitchell has got something, damn it! The film’s director, Matt Piedmont, carried the same aesthetic over to IFC’s bizarre sort-of soap opera The Spoils of Babylon, which Ferrell coproduced. I refer to the theatrical version, not the “unrated” cut or the even longer “supersize” cut. I even laughed at Land of the Lost, though that might’ve been the Stockholm syndrome kicking in.